Do I want to use an industrial-type, apple-planting system? Unless you're willing to commit time every month to playing with your trees, you might be better off trying something else. Other options for diversifying your backyard orchard exist, such as espaliers and fruit cocktail trees, and if you just want lots of apples with little work, a semi-standard tree is the way to go. But if your goal is to grow lots of apples in a small space, and you are willing to put in the effort to win those rewards, one of these industrially tested systems may work well for you. What kind of rootstock should I choose? Experts suggest G.41, (aka Geneva 41), G.11, G.935, M.9 (aka Malling 9), M.9T337, or Bud.9 (aka Budagovsky 9). These are all extremely dwarfing rootstocks, so if you're planting a less vigorous apple variety, the next step up (like M.26) might be better. Keep in mind that choosing one of these ultra-dwarfing rootstocks means it's going to be mandatory for you to keep your trees completely weeded, mulched, and watered at all times, so if you're going to be neglectful, you might want to follow one of our readers' suggestion and plant a semi-standard tree, then use pruning and training to keep the apple's size down. 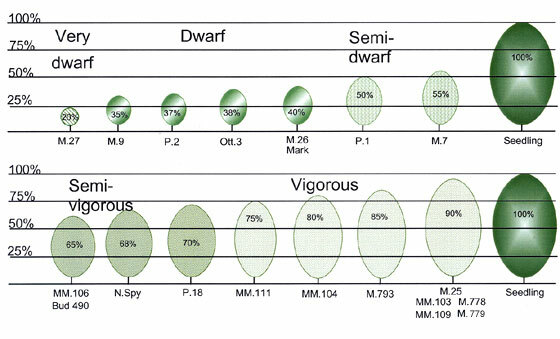 I'm going to include a few semi-standard trees in my planting to allow me to compare and contrast with the dwarfs, but I chose Bud.9 for most of my rootstocks. How close together should I plant the trees? Depending on which expert you talk to (and which high density system you're using), trees should be spaced two to nine feet apart, in rows that are ten to fourteen feet separate. This calculator is a great way to get an idea of proper spacing based on your specific conditions --- I think that three feet is going to be about the right distance between trees in each row in my garden. Meanwhile, the recommended between-row spacing should be taken with a grain of salt if you're squishing these dwarf apples into your home garden since the distance is really meant to prevent shading of the next row over. So I felt quite comfortable leaving a mere four foot aisle between my new tall spindle apple bed and a bed used for perennial propagation since new cuttings prefer moderate shade. How do I prepare for my trees? I laid down a kill mulch of cardboard covered by well-rotted wood chips to prepare for late fall planting of my dwarf apple trees. The mulched row will be about three feet wide, then we'll mow the grassy aisles just like in our vegetable garden. The one big difference between starting a high-density apple row and a vegetable row is that I'm going to have to erect some kind of support for the dwarf trees before they arrive --- either a ten foot tall stake for each one or a trellis --- and will lay out an irrigation system now so watering doesn't get away from me in the spring. The only other tidbit I considered when planning my experimental tall spindle orchard was comparisons to normal apple trees. I'm curious to discover whether the ultra-dwarfing rootstocks will be able to find enough micronutrients to keep apple flavor at its peak, so I'm including a couple of varieties in my planting that I already have growing as semi-standard trees in the forest garden. Once they're all bearing, we'll conduct some side-by-side taste tests. But that's a long experiment in the future. 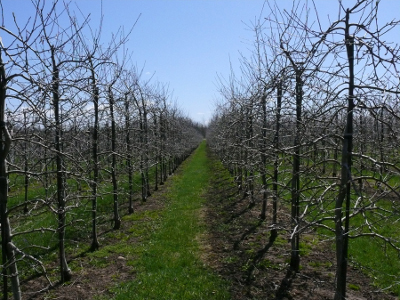 Stay tuned for another post about training and pruning, an essential component of a high density apple planting, coming up soon. Our chicken waterer keeps chickens, ducks, quail, and more around the world healthy with clean water. I'm always up for some new information or at least reinforcing info on fruit trees. This fall/winter I'm taking care of all the landscaping and hardscaping in the back yard so my fruit trees will be ready for their final transplant. Marco --- I suspect I'll be learning about trees for a long time to come.... There do seem to be a lot of options to experiment with! If your interested in knowing. If your interested in knowing: Bud 9 is a nice rootstock. It produces a nice eating apple aswell. Light pinkishy flesh, balanced sweet/acid. It can take the heat well like m111. I have had some fungal issues with it in the summer though. I only use it to test new varieties though. All of my Bud 9 trees are actually grown in 7 gallon pots, because it doesn't do well in the sand. And because of its lineage including some of the Eurasian crab apples, it is good for pollinating. It has multiple bloom times in a season too in warmer areas, so it can be there for the latter flowering varieties. 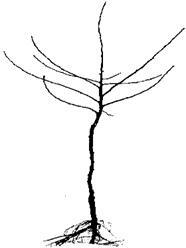 T, I'm very interested in knowing more about the rootstock! If I decide these high density plantings aren't too much work, I'll probably learn to layer my own rootstock since it's expensive to buy lots of dwarf trees. Which dwarfing rootstock do you like the best? I don't have much of a choice in what I can use as a rootstock in my area. I have tried every one I could get my hands on. Nothing stands up to the M111. 20 foot tree, to a 5 foot tree, it has the versatility and adaptability. Apple borers will destroy a tree. I deal with them year round. Very few rootstocks can take them. None of my dwarf trees did, they would normally drop the scion. The only 2 I use are Bud 9 and M111. I'm waiting to get hold of some of the new Israeli rootstocks, but that wont be for a few more years or so. For now M111 is what I recommend and prefer, and what I sell all my trees on. I only use Bud 9 because it would make a tire grow apples. Even if only a couple. All of my seedling wood is grafted onto it, and it easily makes it fruit the third year, if not the second. Imo, Outside of a commercial orchard setting, or a pot, its one of the biggest mistakes to be made, putting apples on dwarf roots. Most backyard growers don't want a full size tree so buy a dwarf. Then they wonder what they're doing wrong when their apple doesn't thrive. Nurseries charge more for the trees, but don't explain that they need more care, making up for the lack of pruning they need. T, I'm very much looking forward to the side by side comparison of our semi-standard trees pruned to dwarf size versus those grown on Bud 9. 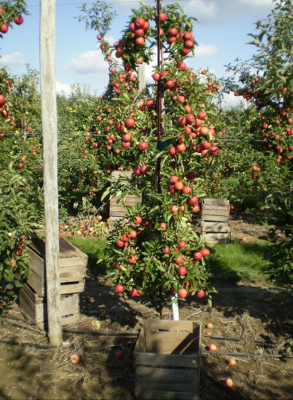 I'm also going to try to remember to ask my local apple nursery guy what kind of rootstock he uses with his trees. They've done extremely well (not pruned to be dwarfs, though) in even the poorest soil parts of our yard. We haven't had trouble with borers, although I've read about them. Our main issue at the moment seems to be cedar apple rust --- fungi generally get us on a lot of our crops. I really appreciate benefiting from your extensive experience! MamaHomesteader --- I'm afraid I have no firsthand information about keeping apples on large rootstocks small. But I'm going to be experimenting with it starting this winter, so I'll be sure to post what I find out. I hope you chime in with your experiences too! Do you top the apple trees? I am wondering about the continued pruning directions for this type of apple tree growth?? Elaine --- This post will get you started in the right direction. In the long run, you will prune the top to a weak side branch, but since the tree is a dwarf, it won't be pushing too hard against the height restriction. skip the highdensity, p[lant standard trees that your kids and grandkids can climb and pick.